The LA Kings made a move on Saturday. The club agreed to terms on a three-year contract with forward Ilya Kovalchuk. “We are excited to add Ilya to the LA Kings organization. He gives us an added element of skill and scoring along with a desire to win. We will withhold further comment until July 1,” said LA Kings GM Rob Blake in a release. "Well, we've been talking about scoring goals in LA for the past year, and he's a goal scorer!" 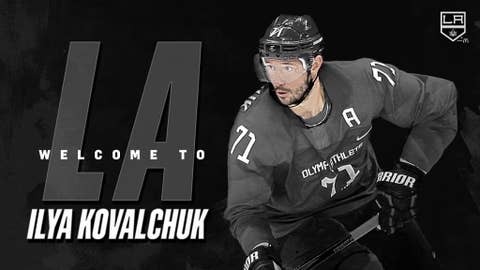 The 6-3, 230-pound Kovalchuk appeared in 53 regular-season games this past season with SKA St. Petersburg (KHL), recording 63 points (31-32=63), 26 penalty minutes and a plus-12 rating. He led the KHL in points, ranked second in goals, fifth in assists and tied for third in game-winning goals (6). He helped lead SKA to the Western Conference Final before falling to CSKA. He tallied 10 points in 15 postseason games (6-4=10), 12 penalty minutes and a plus-5 rating. Kovalchuk last appeared in the NHL with the New Jersey Devils during the 2012-13 season. Kovalchuk aav is $6.25 mil. A first-overall selection of the Atlanta Thrashers in the 2001 NHL Entry Draft, Kovalchuk appeared in 816 regular-season games with the Thrashers and Devils, posting 816 points (417-399=816) and 516 penalty minutes. From 2001 to 2013, no active player scored more goals than Kovalchuk’s 417. He has had two 50-plus goal seasons, and cleared the 40-goal plateau six consecutive years (2003-04 to 2009-10). His 0.51 goals-per-game percentage ranks 18th all-time in league history and was selected to three All-Star games (2003-04, 2007-08 and 2008-09).